These companies are believed to have conned thousands of victims only last year. The scandal is already known in the Uk, where it has reached serious notoriety, and where it is believed that these fraudsters would have only during 2001 swindled victims for more than 12 million pounds. The facts of the swindle are being currently investigated by the judge in charge of Court of First Instance number 5 in Fuengirola, Antonio Vicente Férnandez. 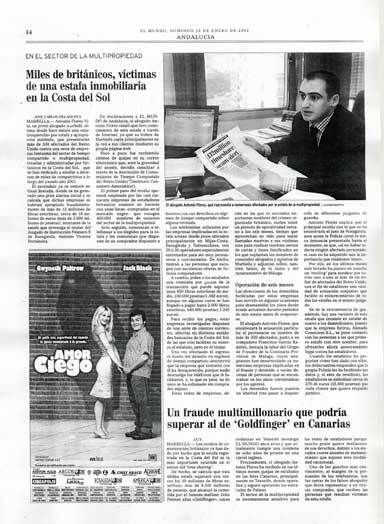 Speaking to El Mundo, Antonio Flores declared that he discovered the fraud by Internet, as his legal practice in Marbella operates mainly via the Web. Gradually, he began receiving hundreds of complaints by email, who he re-directed to the Timeshare Consumers Association in order to be able to mount a joint claim. The Timeshare Consumers Association has received also many hundreds of complaints. The first step in the nefarious operative mounted by the no less than 50 fraudster companies consists of the purchase of list of timeshare owners. These lists are purchased in the black market, and it is believed that 400.000 owners´ details are currently being used by the fraudsters. They then telephone the owners saying they have a buyer who is willing to make an offer for their timeshare. The tele-operators workers used by the fraudsters mainly operate from flats located in Mijas-Costa, Fuegirola and Torremolinos, with 20 or 30 people specially trained to be very persuasive and convincing. In exchange for the offer, and to make the deal possible, they request a sum of money, averaging 850 pounds (1.380 Euros), although in some cases victims have paid up to 2.000 pounds (3.245 Euros) upfront. 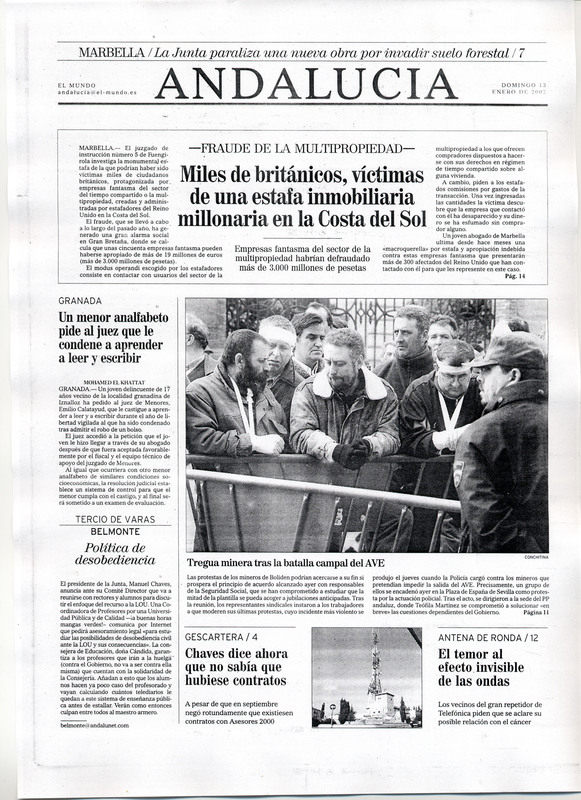 Once the companies have received the payment in several accounts scattered in different banks along the Costa del Sol, the timeshare owner becomes a another victim and will only find dead telephone lines, and in the best of cases, promises that in short the deal will be concluded, after which the lines eventually become silent. The criminal gangs are believed to be run by British criminal organisations, and are normally operate in periods of six months during which they make thousands of telephone calls, fax communications and letter deliveries. In some faxes the fraudsters have used names of Notary Public lawyers in Marbella, and have falsified stamps of the Junta de Andalucia (Andalucia Regional Authority) and the Town Hall of Málaga. 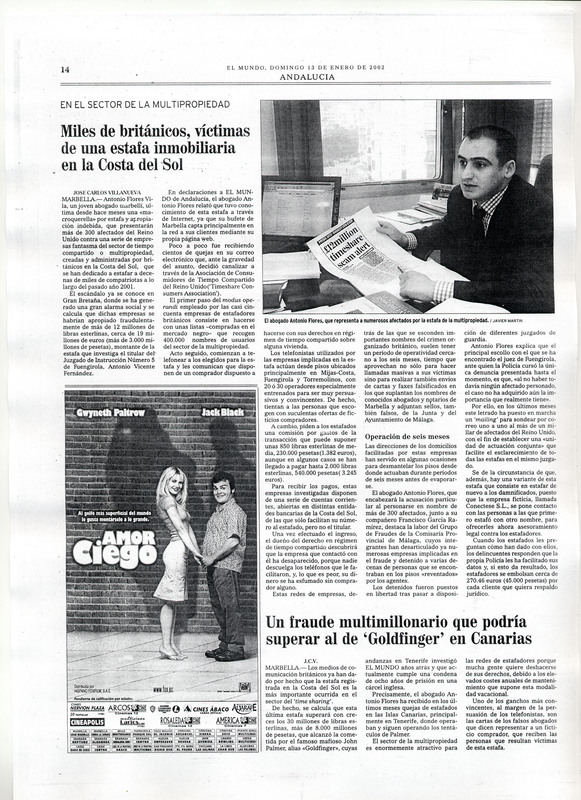 The lawyer Antonio Flores, who will spearhead the claim on behalf of more than 300 victims, together with his colleage Francisco García Ramírez, points out the effectiveness of the Fraud Squad of the Provincial Police Station in Málaga, who have already dismantled some of these organisations and arrested a number of poeple. Antonio Flores explains that the main obstacle encoutered by the judge Mr. Antonio Vicente Férnandez is that as of yet no victim has been properly represented in the court, and therefore there are doubts as to the size and importance of the fraud and the measures which should be imposed on the fraudsters. This entry was posted in In the Media and tagged Antonio Flores on January 13, 2002 by admin.